Smaller amount of cash up front. Probably, not definitely. Most landlords require that you pay a sum equal to the first and last month of your rental agreement. You might also need to pay an additional security deposit for things like having pets. Say the apartment you want to rent is $2100 a month and have managed to find a rental that allows your doggos. On the low end for this lease, you’re going to pay $4200 (1st and last months’ rent). If your landlord is the type to worry about pet damage, and most are, you will probably be charged either an additional deposit or an additional monthly fee. It’s not uncommon to have to pay both. Most pet deposits are at least $400. Additional payments are often per pet so let’s pretend you’re lucky enough to only pay $20 per pet. Your initial payment before you can move in is now $4640. The old standard is 20% for a down payment on a mortgage and $4640 is 20% of $23, 200, which is obviously won’t get you a house in Portland or in most other areas. If you’re still leaning toward a house of your own, keep reading, because we’re going to talk about the down payment myth. Hey, free spirit. Are you not the type to settle down in one place for more than a year? Are you always trying out new states and cities because you call planet Earth your home? We get that. Renting does give you a little more freedom when it comes to moving elsewhere. You don’t have to put your home up for sale. You don’t have to wait as long. You will have some obligations to your landlord, though. If you break a lease agreement, there is almost always a hefty fee involved and you’re probably going to lose your security deposit. There are also ways to stay “mobile” while owning a home, without having to put it up for sale if you decide to relocate. Read on. Most landlords will take care of a certain amount of upkeep and maintenance. Your lease will outline what the landlord agrees to fix, replace, maintain, etc. Sometimes this includes all large appliances, other times it includes very little. Some landlords will take care of lawn work. This might sound great to some of you while it might sound a little invasive to others. In most rental agreements, you’re not going to be responsible for things like leaking roofs, major plumbing, etc. You could, however, get stuck waiting on some things like air conditioning and window replacement, flooring, laundry appliances (if you’re lucky enough to have one in your unit), etc. A landlord is only required to replace certain appliances and features and it varies by location. Let’s get back to that upfront payment we talked about. 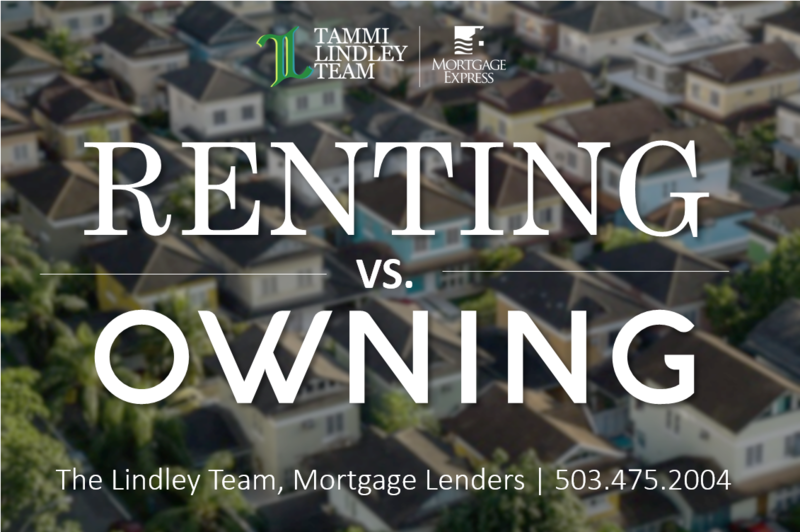 It might seem that renting is always the most inexpensive way to go but there’s also a lot of misinformation out there about mortgage down payments. If you’re just starting out, you’re going to want to know some numbers. Take a crack at our calculator or reach out to us and we can point you in the right direction. As local Portland lenders, we’re especially helpful with local rates and policies. You could be closer to the amount you need than you think you are! Where rentals often charge extra for pets or prohibit them entirely, your house is your home and your pets are your family so they’re obviously welcome! Not only are your pets allowed in your own home, but you’ll often have more room for them to roam. If you’re in a single family unattached unit, you’ll also stress less about your dogs barking while you’re gone or your cats scratching at the walls, attempting to dig through to your neighboring apartment, because they’ve been ignored for the 10 minutes you’ve been missing, and they’ve already decided to run away because they deserve better. If you’re looking for a Portland mortgage, you’re in even more luck because we’re a very pet friendly city! Also, we’d love to hear about your pets when you call. No, really. We would. Tell us about your pets. Then tell us more about them. Please. Also, bring a picture. It’s important in the mortgage process that we see your goodest boys. Science or accounting or something. Totally legit. Yeah, this was on the rental benefits list, but a different kind of freedom deserves a place on the mortgage benefits list. When you buy a house, you have a lot more freedom to make it a home. If you’re like what seems to be everyone ever right now, you’re probably into some kind of fixer upper or home improvement show, and you’ve got a Pinterest full of plans. Rentals usually have a very limited number of things that can be modified if any at all. More importantly, however, you have secured yourself freedom from every having your rent raised on you. You have an asset that will appreciate over time with a fixed monthly payment (most likely – depending on the loan you choose). And remember that “mobility” issue we were talking about earlier? One aspect potential home buyers don’t often consider is that if you want to relocate, you can always rent out your home – because it’s YOURS! Not only do you have an appreciating asset, you have the ability to produce income off of that asset. Amazing, right? Now – this is an over simplification of everything to consider, but our goal here is to expand your mind with possibilities, and the reality of a lot of home owners. Don’t stress. We’re here to help. Obviously, any sort of home purchase or rental is a big, important decision and no single choice fits every person. We get that and that’s why we take a big-picture approach to the process. When you talk to us, we’ll learn about your current situation and your future goals and we’ll help you make plans. We’ll be with you for the entire process no matter how long it takes. Instead of juggling a dozen different office trips and phone calls, just start with one. Give us a call and we’ll help you get where you want to be, in a home that fits your style.We’re the mortgage experts so you don’t have to be. Don’t forget the dog pictures. Seriously.